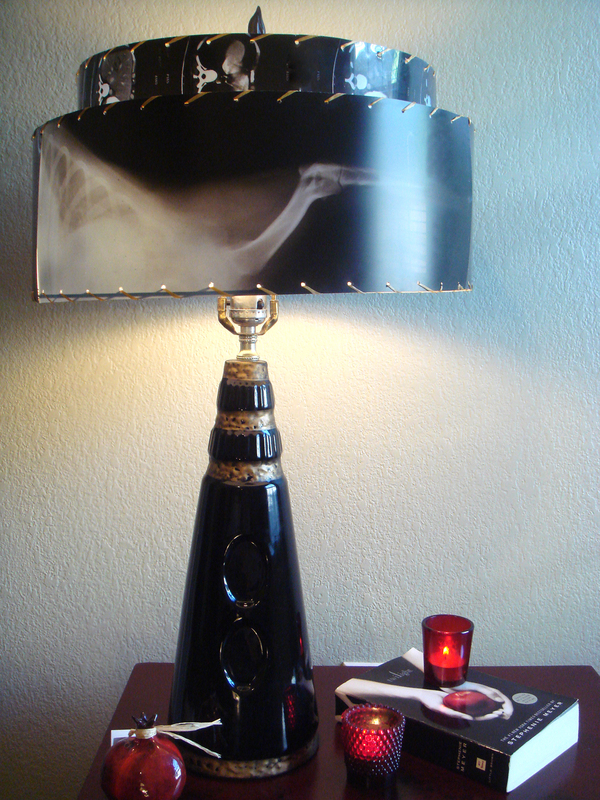 With October lurking around the corner, Gadora spied an opportunity to redress an already fabulous retro Kron® lamp with discarded X-rays: an MRI of one Camille so-and-so and someone else’s pet. Here, lamp before Gadora got a hold of it. Gadora carefully removed the brittle paper shade as it would be a perfect pattern for the next. Using it as a stencil, I cut along its edges, cutting the X-ray sheets into the appropriate sizes for the new shade. Once all pieces were cut, I sprayed a light coating of white paint on the back of each X-ray sheet. This allows the X-ray shade to really shine once the light in on. At first, I tried cutting the holes for the whip-stitching with The Squeeze’s metal leather hole punch, then—finding the 2×4 too soft a surface—got out the handy power drill. Using the old shade as reference, I place it over the new surface and cut holes an inch apart. Gadora loves her power tools (and short cuts)! Cutting the artificial sinew (using real sinew would be downright creepy!) into strips a little longer than the length of each Xray piece, I tied a knot at my starting point and began the arduous—but speedy—task of whip-stitching the shade onto the metal frame. The finished product is at once vintage and relevant. In a sunny room, the shade gives a hint at its sinister evening costume. Left: close-up of Kron® logo fired into original ceramic base, with original well-preserved gold detailing. Right: close-up of X-ray shade. Using the MRI X-rays on the top level of the shade is a nice complement to the bottom and larger X-rays. The other two X-ray sheets towards back of wall, while see-through, are less dramatic than this canine limb. The lamp lit up. Because the barrel shade was so large, Gadora knew it would emit enough light from both top and bottom to make a dramatic statement in any room befitting its style. Supplies: X-ray vision and 3-5 X-ray sheets, shade frame (metal), sinew (synthetic), white spray paint, metal hole punch, hammer. And a fired-up power drill as a back up. Time it takes: 30-40 minutes to cut, spray and drill X-ray sheets. 30 minutes to dry. 45 minutes to weave sinew through holes onto metal frame. Precisely 2 minutes to wipe the smirk off your face for a job well done. 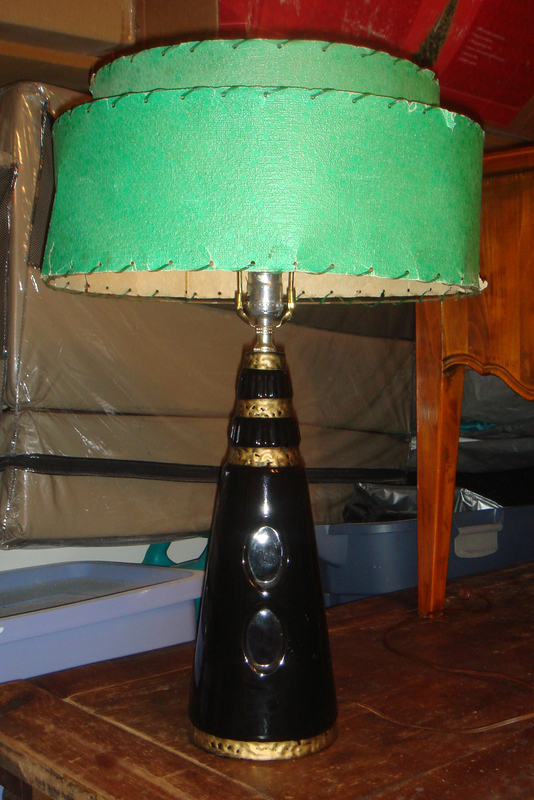 Posted on September 30, 2009 March 1, 2010 by gadorawilderPosted in BEFORE & AFTER, Do-it-YourselfTagged Do-it-Yourself, easy art project, Kron TV lamp, mid-century modern, table lamp, vintage. Previous Previous post: Six-pack of dogs, minus one. im also making an xray lamp but without an existing lamp. if i dont have a lamp shade and i directly put the x ray 3-4 inches away from the bulb will it melt or something? That’s hard to say, but low energy bulbs tend to generate much less heat. Thanks for looking. The “inspiration” pendant lamp I mentioned had the inside of the Xrays sprayed white. I think it is totally a preference thing, but with the 2-tiered shade, serves to “hide” the bulb when not lit. Please send me a pic of your finished piece! Good luck. I have always wanted to make one of these and I am finally starting to get my supplies together to do it. You’re instructions were the first ones I found that told me to paint the back of the x-ray white. Does it really make a difference? I thought it might make it less transparent….does it? 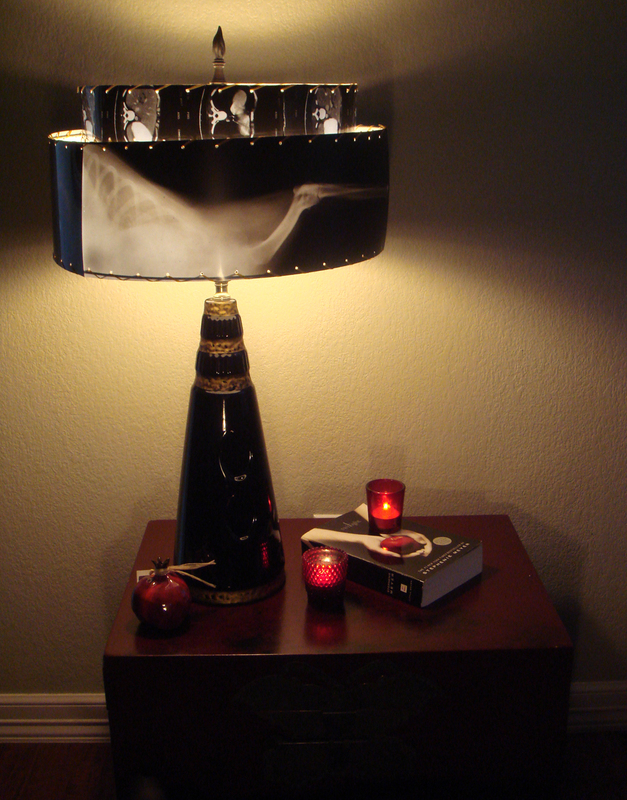 In response to the Craigslist posting: “This is really awesome but I hope you have kept this lamp bc it really goes with the Twilight book.” ~ C. Sutherland. Exotic and interesting! What an eye you have.